With a small amount of searching, items can be found on the auction house for next to nothing that will greatly increase your characters ability, beyond that which was probably originally intended. This completely breaks the flow of the game. 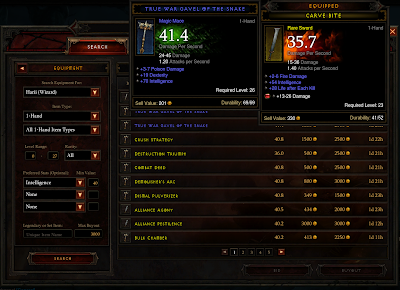 The draw of Diablo is to constantly have your character slowly but progressively improving, and every now and then a big magic item will drop that greatly buffs your character. This is a great moment, but now it made completely moot by the auction house. Now it is possible to get items that are much better than anything that will possibly drop due to the fact that you can access items dropped for higher level characters, for next to nothing. There are several major issues with the auction house system that currently break the game for me. Firstly, the item pricing. Items are put on the auction house for cheap, because they are dropped for higher level characters who just want to make a small amount of money. These items aren't worth much to them, but for lower level characters, they are extremely overpowered and valuable. Also when selling an item, the auction house does not give any indication of how much an item is worth. It is still early days, so it is possible that the market will eventually settle, however this currently is not the case. This could be fixed by having the market restrict prices of items, so that to earn these items players would actually have to save up enough gold. Currently the prices of these items are comparable to items half as good sold by the NPC vendors, making them almost entirely redundant. Secondly, level caps. There is only one restriction to whether a player can use a certain item or not (apart from class specific items) which is their level. However the items available to players do not seem to be balanced enough for allowing easy access to an auction house not to break the game. With some balance changes, which I strongly suspect Blizzard will be rolling out for years, this may well improve, however currently the level requirements on some weapons seem to not match up with their capabilities. This is only made worse by the third problem - gems. 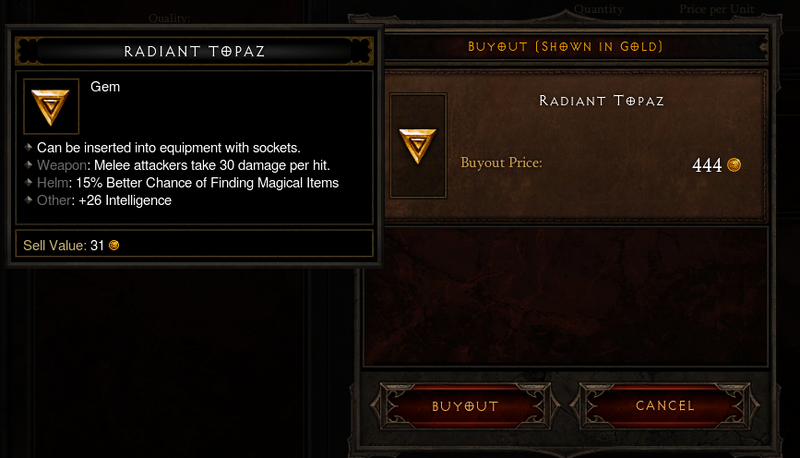 The gems in Diablo are items that could be inserted into equipment that has the "socketed" attribute. These gems provide bonuses, and there are many different tiers of gems. The higher level tiers of gems are clearly designed for higher level players, but these have no level requirement on them. On the auction house it is not difficult to buy cheap gems that are designed for characters around Level 45, for next to nothing. 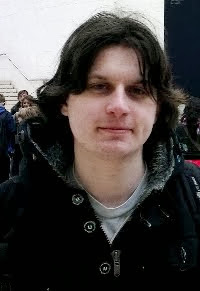 This gem is a about middle tier. To make this gem in-game at lower levels would cost many thousands of gold. These gems can be bought on mass, and added to many pieces of equipment by levels 20-25. It was at this point the game started to break down for me. By accessing the auction house and being able to buy these things, I was able to ruin my own experience by reducing the difficulty down to nothing. 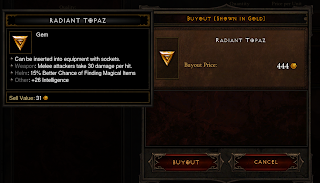 This ruined the flow of the game, which is the magic of Diablo. Hopefully Blizzard are aware of these issues and will be bringing balance changes in the future, but beware, using the auction house is a slippery slope that will most likely make your first run through the game a trivial and dulled down experience.